For many years, there has been a clear split between two groups of software: B2B and B2C. Naturally, business or Enterprise software has to provide many features, rich content and must fit multiple purposes. For various reasons, business software is in many cases not easy to use nor is it beautifully designed. Often, software has been designed before user experience and user feedback became popular in the software design process. After B2C software, like smart phone apps, became more popular, users recognize the differences. Users use their phone every day for simple tasks such as writing e-mails, checking their bank accounts or playing games. These apps are designed to fulfill a simple task in form of an app. Back to their B2C software, maybe a complex ERP system, users see the difference: User experience. Most users are way more experienced with software nowadays. They bring their own devices, their own software and expectations. Because of their experience, they might reject the complicated ERP system with hundreds of unused features that have been only implemented to convince an executive to buy the software. Enterprise software should be accessible from everywhere simply using a standard browser. The data should be in a cloud - it doesn't matter, if this cloud is an internal data center for security and data protection reasons or a cloud service. Of course, this is nothing new and this shift already began years ago, specifically with online services such as Basecamp, QuickBooks Online and SalesForce. For several reasons, web applications focus more on typical tasks of the software. That is because these applications have been created from scratch and went live faster to start early. But this fact made those applications successful, because they were usable. Keep the fat client applications and provide additional applications such as a web interface or an app to achieve the most typical tasks. Port the application the web completely and remove the fat client. Data goes into the cloud and users are more flexible. The first way is more a slow transition that gains time to do the complete migration to the web and cloud. Web applications should be easy to use and user experience should have a main focus when re-designing software for the web. At the same time, it is also important not to change things users like and are used to. A typical example of a well-tested and common design is the interface of a word processor, specifically the look and feel of Microsoft Word. Users are used to the interface and know how to achieve their daily tasks. We at Text Control strive to provide the best available user experience for word processing and report generation interfaces. An MS Word inspired interface is available for all .NET platforms including Windows Forms, WPF and ASP.NET. We help developers to transform the successful fat client application to the web without removing well-working interfaces such as a word processing interface to create reporting templates, letters or quotes. 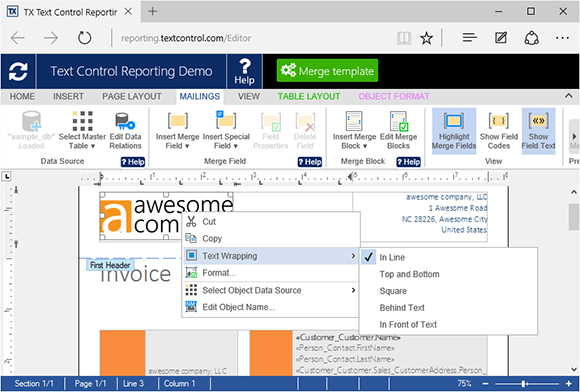 Using the ASP.NET controls for WebForms and MVC, a fully-featured, WYSIWYG rich text editor is available that brings word processing and document generation to all HTML5 based browsers such as Chrome, Firefox, Safari, Microsoft Edge and Internet Explorer. These components doesn't require any plug-ins or downloads. As part of our service and based on the knowledge of many successful migration processes we helped with, we help users to migrate Windows software to successful web applications. Contact us to discuss your options and we would be glad to help. Start today and download the 30-day trial version of TX Text Control .NET Server for ASP.NET that comes with easy-to-use tutorials and sample applications to start your migration process.